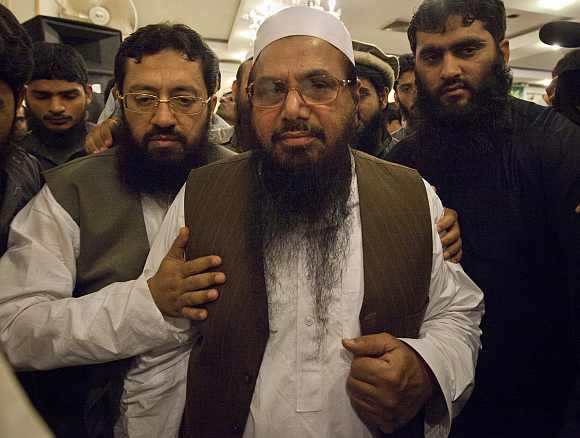 The Pakistani government has told the Lahore high court that no violation of law has been made in the detention of Mumbai attack mastermind and Jamaat-ud Dawah chief Hafiz Saeed and his four aides. The government also told the court that it has reasons to believe that Jamaat-ud Dawah and its sister organisation Falah-e-Insaniat Foundation were engaged in activities which can be prejudicial to peace and security. In a written reply submitted to the court on Thursday, the federal interior ministry defended the detention of the JuD leaders on January 30, saying the action has been taken under the Anti-Terrorism Act, 1997, which deals with the proscription of persons. The ministry said that the JuD and FIF had been kept under observation on the basis of a report sent by the ministry of foreign affairs. "In light of that report, the federal government had reasons to believe that JuD and FIF were engaged in certain activities which could be prejudicial to peace and security and in violation of Pakistan's obligation to the United Nations Security Council resolution," it said. The interior ministry requested the court to dismiss the petition of Saeed and his aides challenging their detention. The division bench headed by Justice Sadaqat Ali Khan examined the report and adjourned the hearing on the petition till April 27. The government on January 30 had put Saeed and the four leaders of the JuD and FIF under house arrest in Lahore under the country's anti-terrorism act. Saeed along with Malik Zafar Iqbal, Abdur Rehman Abid, Qazi Kashif Hussain and Abdullah Ubaid filed the petition in the Lahore high court through senior advocate A K Dogar. Saeed has a bounty of USD 10 million on his head for his role in terror activities.